It seems like there is African designer popping up everyday. There are some good ones and some not too good ones. 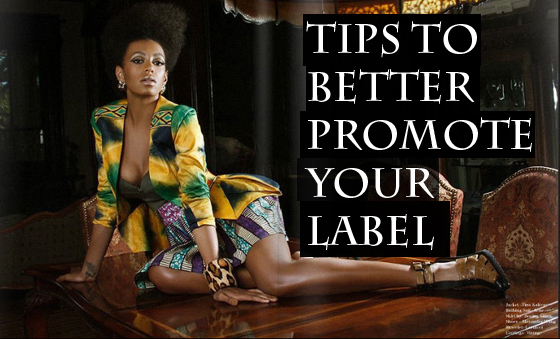 Because the African fashion industry is booming a lot of people are taking advantage of that to launch their labels with no training at all. I will make a post about those who are just starting out and needs tips start their business in a separate series. This post is about those who already started and are struggling to put their names out there. Below are 3 simples tips to get you going. One of the most important thing to do in this day and age if you are a designer is to create a website. Its a way for those of us that are far from you to access your work.You do not need any fund to create a page to promote your work. You can start by creating a blog . The task is not only to create a site but make it user friendly and updated. I have visited websites of a few African designers and did not know where to get the info I needed . The layout was poor and the first page was overloaded with pictures. It's also very disappointing to visit your fave African designers sites only to find that the sites no longer exist.If you want to see what a great fashion website look alike you can check out Maki-oh's , Christie Brown's or Tiffany Amber's. 5 years ago African designers had an excuse because there was only 1 or two sites out there promoting African fashion. Today there are multitude of websites , magazines , and blogs dedicated in promoting the work of African Designers. Don't expect people to find you and talk about you because keep in mind that there are plenty of talented designers like yourself knocking at every door to promote their work. keep the bloggers informed of every important event happening with regards of your brand. If you are selling online offer them discount codes for their readers. Believe it or not a good discount will bring me to any fashion site especially my favorite brands. Example of a designer that is always on top of their game as far a keeping ciaafrique on the loop is Virgos lounge. @figoszi I am with you in the price. I don't mind paying for quality at a high price however I am against people that uses African print to make crap clothes and try to sell it for millions. Yeah part 2 is far more interesting. Don't you agree with me ? if you are friend all the media people then you sure to have good publicity all the time. I'm glad you brought this up because not only is this a problem for a lot of African designers but it's the same problems for a lot of American designers as well. E-commerce is still the route to go because a lot of the high-end stores still aren't stocking their clothing.